Friday 26th April saw the loading of all the easels and lighting into the hold, and it was a busy day for everyone who came along to help. 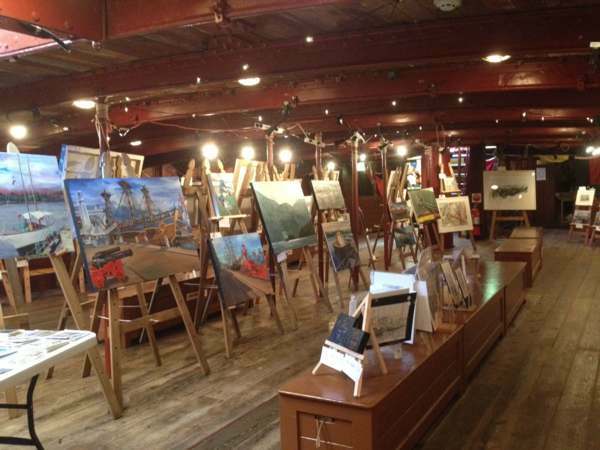 Marine Artists are a convivial bunch of people, and although it was a warm day, the new individual spotlights for the easels and associated electrical puzzles were soon sorted out and the exhibition was set up ready for viewing. 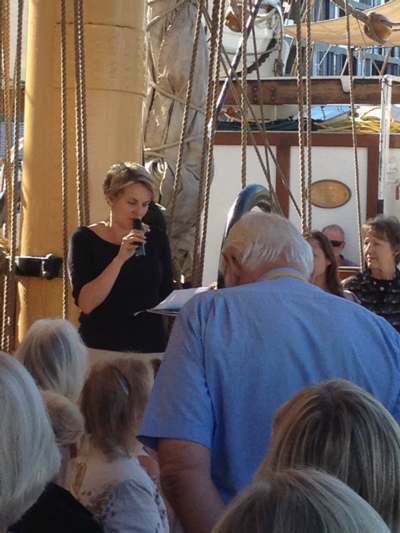 The exhibition was opened by the local Member of Parliament for Balmain, Ms Tanya Plibersek. A crowd gathered in the bright sunshine of the main deck of the James Craig to listen to her enthusiastic welcome, and afterwards we all 'went below' for refreshments and to view the paintings. Labels: Ms Tanya Plibersek is Guest Speaker., Salt in the AIR exhibition opening.